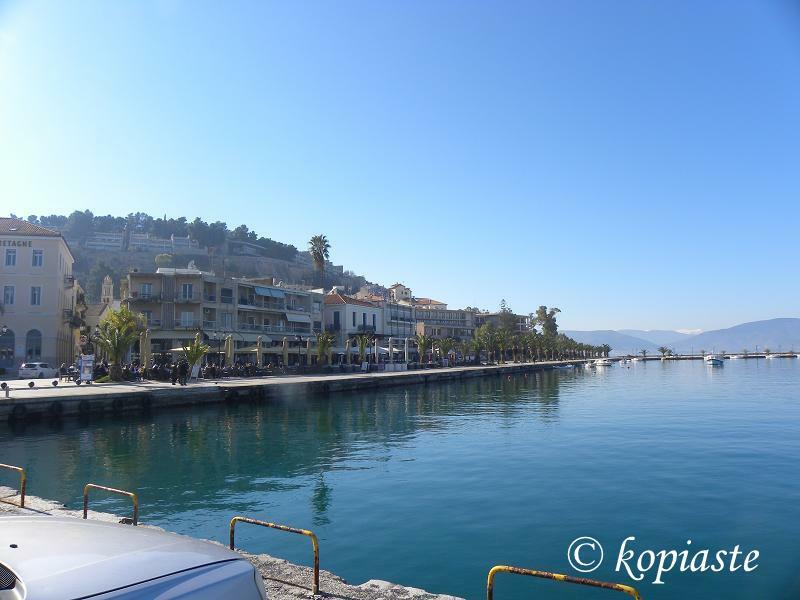 In Part I, of my post regarding Nafplion, you can read about the history which lead to making Nafplion the first capital of Greece and a tour from one side of the port to the other, which ends at the Promenade and a reference to Acnonafplia, with lots of pictures of the port and Bourtzi. The castle of Bourtzi (Greek: Μπούρτζι, from Ottoman Turkish burc meaning “tower”) is a fortified islet and is located in the middle of the harbour of Nafplio. The Venetians completed its fortification in 1473 to protect the city from pirates and invaders from the sea. Built in 1471 by Antonio Gambello, an architect from Bergamo. The Greeks regained it from the Turks on June 18, 1822, from where they assisted in the siege of Nafplio. Until 1865 it served as a fortress. It was then transformed into residence of the executioners of convicts from the castle of Palamidi. From 1930 until 1970 it was run as a hotel. At the end of the parking place there are boats which make tours to the islet that leave from there frequently during the summer. In Part II, we will explore the old town of Nafplion which was created by the Venetians. We will pass from many narrow streets with beautiful old houses, balconies and stairs with pots of flowers, window sills with geranium flowers, beautiful bougainvilleas in many colours unite from both pavements, forming tunnels to walk under and we shall see the most important buildings and monuments of the old town. Returning from the promenade and returning back to the seafront road, just opposite is Philellinon Square (meaning friends of the Greek) with the monument dedicated to the French soldiers, who fought and died during the liberation from the Turks. At the entrance of the square is the statue of Manto Mavrogenous, a heroine of the Greek Revolution. She was a rich woman who spent all her fortune for the Hellenic cause. Under her encouragement, her European friends contributed money and guns to the revolution. We shall leisurely walk around and find about some of the places to visit and see some of the historical buildings. On one side of the square is the Grande Bretagne Hotel where many famous people stayed there. To mention a few, the Swedish King Gustav Adolf, the couple Sophia and Eric Sleeman, who discovered ancient Mycenae, the American novelist Henri Miller, etc. On the same road you will see the Club for members of the Greek army. Two blocks away from Philellinon Square is the old Customs House, by architect Stamatis Kleanthis (19th century). The church is just behind the Archaeological Museum but instead of going towards the Museum, we shall continue the road and see some antique shops and return back to Syntagma (Constitution) Square, on our way back. At the end of the road you can go to the right and visit the Five Brothers. It owes its name to the five cannons that defended Nafplio in the west in combination with Bourtzi and was constructed by Venetians in the late 15th century. Going left on Staikopoulou Street, you will keep seeing small narrow streets an sometimes stairs which lead up to higher parts of the old town. The street is full of souvenir shops, restaurants, shops with local products and many more. On your left you will encounter Vouleftiko, the old Parliament House, which was built as a mosque during the second Ottoman Occupation. In years to follow it became a school, a prison, a court house. Today it houses cultural events. On your left at No. 25 Staikopoulou Street, is the Komboloi Museum, a unique museum all over the world with over 1000 “komboloia” (worry beads) from different cultures dating from 1700 – 20th century, made of amber, sea shells, horns, elephant tusks, coral, crystal, etc. The museum is on the first floor of a building on 25 Staikopoulou Street. The ground floor is a workshop making, repairing and selling worry beads. Some well-made copies of these can be purchased. At the end of Staikopoulou Square we reach the church of Agios Spyridonas, where the first governor of Greece, count Ioannis Kapodistrias was assassinated. On the wall of the church is a sign showing the place he was murdered and the hole where the first shot missed him, framed. Anywhere you look up, you will see the beautiful balconies on the houses. The Constitution Square is just a block below, so you can head towards that direction and turn left or go back taking the same route. Any narrow street on your right will lead you to Syntagma (Constitution Square). Looking up towards Acronafplia, we can see the Clock Tower. It stands where in antiquity used to be the Acropolis of the town. The clock came from Bavaria during the rule of King Otto. During World War II it obstructed the view of the German machine guns, so they blew it up. The mechanism of the clock was was put away and after the war the tower was built again. The clock started ticking again on the 14th September 1949. Syntagma (Constitution) Square is the biggest square in Nafplion with the richest history. On one side the Archaeological Museum, which was built by the Venetians in 1713. The Archaeological Museum of Nafplion is situated in Syntagma (Constitution) Square, in the centre of the old town. The three storey building was built by the Venetians in 1713 and served as barracks. There are so many interesting things to see in the museum, so do not miss visiting it. Exactly opposite, on the other side Trianon, which was built as a mosque during the first Ottoman occupation, during the Venetian occupation it became a Catholic Church, later a school and in recent years as a conservatoire (music school) and a theatre and later as a cinema from which it took the name Trianon. Today it is used for cultural events and art exhibitions. On the other two sides there are beautiful buildings, which used to be the houses of the heroes of the revolution. Today on the ground flour they operate mainly as cafes or restaurants. Very close to Syntagma Square, at the end of Amalias Street is Palamidis Municipal Library. Further down at 22 Amalia’s Street is the War Museum. This was the First Military Academy in Greece, built in 1829 but also the first Higher Education Institution in the country. At the beginning of Vassileos Constantinou Street, which ends at the mosque on Syntagma Square, you will find the Admirals’ Square (Trion Navarchon), where the first High School (1833) operated and now it is the Town Hall, further down the first Pharmacy of Greece and opposite in the Square (Three Admirals’ Square) the Statue of King Otto and the tomb of Demetrius Ypsiantis, a hero of the Greek War for Independence. A Neoclassical building of 1911 with the busts of Polyzoides and Tertsetis, two figures of the judicial system. Just opposite the Courthouse is the KTEL (long distance) Bus Station. From the Square of Trion Taxiarchon, crossing Syngrou Street, just opposite is Kapodistrias Square. There are two ways to reach the Fortress of Palamidi (216 m. height). One is by car and the other is a challenge to climb its 999 steps (or 874 to others) up to the top. The fortress was a very large and ambitious project, but was finished within a relatively short period from 1711 until 1714. It is a typical baroque fortress based on the plans of the engineers Giaxich and Lasalle. In 1715 it was captured by the Turks and remained under their control until 1822, when it was captured by the Greeks. The fortress commands an impressive view over the Argolic Gulf, the city of Náfplio and the surrounding country. On your way to Palamidi or going towards Tolo, you can make a small detour and visit the Bavarian Sleeping Lion. Follow the signs to the police station, it is a right turn, and follow the road down. At the end of the road turn left towards the small park, the Lion is carved into the rocks in the park. It is near the church of Agion Panton (All Saints church) and the old German cemetery. Many of King Otto’s soldiers died of a typhoid epidemic disease. As a tribute to those dead, King Otto’s father Ludwig of Bavaria commissioned Christian Siegel, a German professor of sculpture in the Athens Polytechnic, to engrave this sad, sleeping lion similar to the Lion of Lucerne, in Switzerland, on a rock near the cemetery. The men were buried in this cemetery of Aghii Pantes (all Saints) but later their bones where exhumed and now lie under the crypt of the Nafplion Catholic Church. The locals call this monument “Aggouroon” as according to them the Bavarian soldiers died after eating some kind of wild cucumbers. Below the lion there is an inscription in German. Although I do not know German from what I make out of it, I think it says “In memory of the officers and soldiers of the Royal Bavarian Brigade of the period of 1833-1834 who died of an epidemic disease. This monument was founded by King Ludwig of Bavaria”. In front of the Lion of Bavaria there is a small park with benches where someone can rest after touring the city. Walking in any part of the town you will notice that Nafplion must be the town with the most bougainvilleas, making the narrow streets and renovated old houses look even prettier. Narrow streets and stairs from various parts of the old town. As you may see, some restaurants have their tables on the streets. For more pictures you can watch a slideshow here, or some pictures in my flickr albutm. If you haven’t seen the train tour, you can see a video here. If you want to go swimming and don’t have a car, you can go by foot to the beach of Arvanitia. However, if you do, going towards the direction of Palamidi, you will find the sandy beach of Karathonas, which is only about 3 km away. There are also lots of other beautiful beaches to the east of the town within a range of 10 km such as Assini, Tolo, Drepano etc., and to the west Nea Kios, Myloi etc. There are still more to be written about Nafplion in the future as we have decided to relocate. Hopefully, we shall be moving there by the end of summer, so I shall be writing about this in another post. the city is beautiful, would like to take a visit there.